Well, it could be any part of this country, scratched open and bleeding with forced disappearances, impunity made institution, intolerance as a form of government, corruption as the modus vivendi of a fetid and mediocre political class. But it could also be any part of this country healed by the persistence of the families who do not forget their missing, their tenacious search for truth and justice, their rebellious resistance in the face of blows, bullets, and clubs, and their eagerness to construct a path without masters, bosses, saviours, guides, or caudillos; through defence, resistance, rebellion; through the strength of pain and rage making the crack deeper and wider. “Mexico” as this country is commonly called, reflects in its own way the crisis that is shaking the entire world. It seems that at some moment in the brief and intense history of the 20th century, this country was an international referent for tourism. One heard about its landscapes, its gastronomy, the hospitality of its people, the perfection of the perfect dictatorship. But both before and during this travel agency pamphlet image, what happened happened. No, I won’t ply you with information on what has happened in the immediate past, say the last 30 years. The thing is that over the past few years, “Mexico” has become a world referent for governmental corruption; for the cruelty of narco-trafficking; the full complicity and cohabitation, not merely infiltration, of organized crime and the official institutions; the forced disappearances; the army out of the barracks and into the streets and onto the highways; the murders and imprisonments of opposition figures, journalists, and others; the “warning” signs on the paths of tourists; the cynicism as idiosyncrasy in the media and social networks; and life, freedom, and personal possessions gambled in the deadly roulette of daily life (“if they didn’t come for you today, maybe tomorrow”). If you are a woman, of whatever age, multiply the risks. The feminine, along with any difference, is ahead only in this respect: more likely to suffer violence, disappearance, death. But you already know all of this. It is enough to have lived here, in these lands and under these skies, a little, not much, let’s say from just a few months old to less than five years old, which was the age of the little girls and boys murdered in the ABC Daycare in Hermosillo, Sonora, Mexico, June 5, 2009, almost seven years ago. What crime did those children commit? Were they victims of bad luck, of a dark divine design, of chance? Or were they victims of a political class that allows itself anything (such as the fact that one of those implicated—and not investigated—in this crime is a pre-candidate for the Mexican presidency for the National Action Party)? So the place could be Sonora, where nevertheless, neither the crime nor the shamelessness of those responsible were able to defeat the families of the toddlers of the ABC Daycare. Or the place could be Mexico State, where the Ñatho community of San Francisco Xochicuautla is at risk of being destroyed and buried by one of big capital’s highways. Their crime? Defending the forests. But, on the ruins of their homes, the community members maintain their resistance. Or it could be Veracruz, already a territorial hunting ground targeting women, young people, and journalists, whether or not they are oppositional. Or the Yucatán, where the government has implemented the so-called “Escudo” [shield] against the population of Chablekal as a way to protect its own acts of displacement. Or Guerrero, where all of Mexico is renamed “Ayotzinapa.” Or Morelos, converted into a gigantic clandestine cemetery. Or Mexico City where opposition protests are prohibited because there the automobiles rule, including over the Constitution. Or Puebla, bastion of water and highway privatization. Or Tamaulipas, where, like everywhere in the country, the PRI is the institutional arm of organized crime. Or anywhere in this republic called “United Mexican States” with its waves of firings, displacements, theft, disappearances, destruction, death…war. The poorly named “education reform” is not about education but rather about labor. If it were about education it would have taken into consideration the perspective of teachers and families. When the government refuses to dialogue about the reform with teachers and families, it is acknowledging that this is not about improving education, but about “payroll adjustment” (which is how capital refers to firings). The law isn’t being applied, it is being violated. Those who say they are defending the constitution (through the educational reform) are violating the constitution (the laws that guarantee basic rights such as gathering, petition, and free movement). What the paid mass media are doing is useless. They declare back and forth: “everything running normally,” “the majority of schools are still functioning,” “over 90 percent of teachers are working.” But there is no referent in reality for these declarations, because the teachers are in the streets. In the villages the families already said clearly that they will not accept substitute teachers, that they won’t let them in or will run them off. The teachers aren’t defending their privileges, they are fighting in the last trench any human being has: for the minimal life conditions for them and their families. Are you surprised that someone is willing to defend the little they have left? A despicable salary, a few classrooms that look like they have been bombed (and they have been, but by economic bombs), not one but multiple work shifts, excessively large classes? In sum: little pay, bad working conditions, and a shitload of work. Sound familiar? And yet, the teachers show up at their schools and teach the little boys and girls the ways of the arts and sciences. The objective of the supposed education reform is to destroy those teachers who prepared for years and dedicated practically their whole lives to this profession. Of course, due to the perseverance of the media, which gets bonuses for their trouble, the teachers’ movement has been given the image of corrupt leaders. But this image is just a decoy, an attempt to get people to take the bait. The objective [of the reform] is not the leaders, but all of the teachers, including the servile National Education Workers Union [SNTE]. Now, if you want a model of corrupt leaders, you have the leadership of the SNTE. Yes, the objective of the education reform is to privatize education. In fact, this privatization is already in process. The attempt to abandon and defund the schools didn’t finish off public education in Mexico for one reason: the teachers. So now the teachers must be destroyed. They [the government] are trying to provoke a catastrophe in the education system such that families turn to private schools, working double shifts to pay for tuition, or resort to raising their daughters and sons on television, radio, and digital media, or in the street, or not even that. The teaching profession is not improvisational, nor is it a question of intuition. It requires study, preparation. Not just anyone has the capacity and the knowledge to educate. Because in school students are educated, not just taught. Not just anyone can successfully take on a group of school-age or preschool-age children. That is why the Escuelas Normales [Teachers’ Colleges] are necessary. Have you been told that what’s going on is that the teachers are lazy and don’t want to study? That’s a lie, any teacher wants to be better, better prepared and better trained. Do yourself what the government hasn’t done: talk to a teacher. Even better, listen to them. You will see that when they talk about their situation, it will seem like they are describing yours. 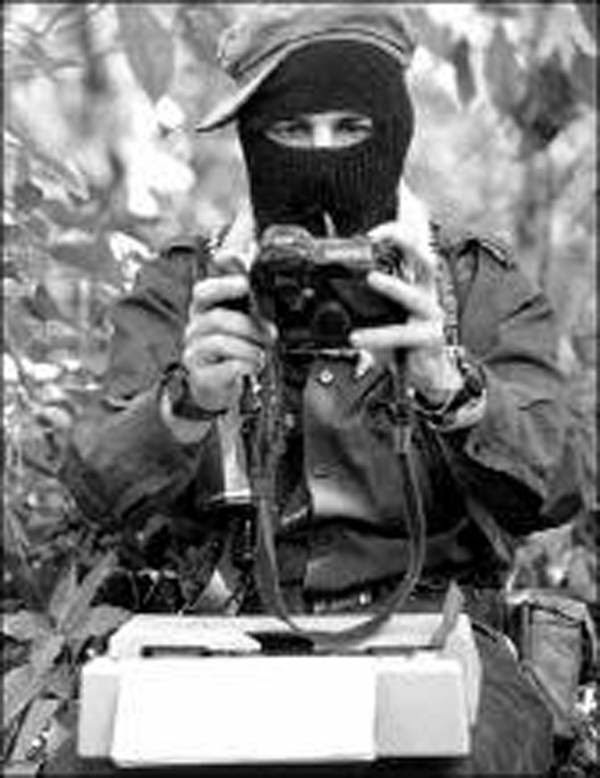 “Compañero Subcomandante Insurgente Moisés, I greet you and hope that you are in good health and doing the work of the struggle. Having given this brief greeting, I offer my report: Well, we saw the teachers’ march. It wasn’t just male teachers, there were also many female teachers. The damned police attacked them and also attacked the people nearby. They even beat children. Later we saw a sign, well a sign painted on a wall, that said: “The police: such badasses against the people, such pussies against the narco.” We saw that the teachers were happy in the march. As if they didn’t care that they were being beaten and pursued and sprayed with that gas that doesn’t let you breath. The teachers [male and female] just kept going, along with some of the mothers and fathers of the children that go to the schools and whose families support the teachers. It was clear that no one had forced them to go, but rather that they had come because they wanted to. They were excited. And the people in the houses along the street were shouting their support to the teachers. And in the streets people gave them water and fruit. You can tell that the people love those teachers who are in struggle. So then the teachers would shout the chant, “we see your support” and well, I thought there’s probably support that isn’t seen also, but there’s no chant for that. Later we went to see the damned police who were following the teachers in order to harass them. We saw the police looking very defeated. There were just a few who were enthusiastic and who were beating their batons on their plastic shields, supposedly to frighten people, but it’s not frightening. The majority of the police could barely walk, I think because of the heat. The sun is strong in Tuxtla. And the teachers, well you can tell they’re used to it because they were happy. They sang songs and yelled chants. They sang that one called “We shall overcome” and I even started to sing too, but then I remembered that I was there in the role of “Tercio compa” and so better not. Every time the police paused for a moment they would all run for the shade. Their commander would scold them because they didn’t stay in formation. We heard one police officer telling another about how he pursued a little girl and a teacher, and that the teacher ran faster than the child. And that damned officer laughed like it was a joke to pursue a little girl. And when they got the order to advance, the police went dragging their shields behind them. Some were wearing metal boots. Others carried clubs. As they went by, the people in the street would say things to them, telling them to leave and not to bother the teachers anymore. Some people straight up cussed them out. The police looked at them with anger in their eyes but they didn’t stop. And these are families that are yelling. In some houses and buildings there were signs, like homemade posters expressing support for the teachers. On the radio stations people called in to comment, but not like other times when they complained that the teachers were blocking roads. Now they were complaining about the federal police, that they are just creating trouble, that it looks like we’re at war, that not even during the Zapatista uprising were there so many police in the streets of Tuxtla. No one was thanking the government; they were all saying clearly that this is all the fault of the government. And the radio stations would cut the people off, you can tell they didn’t like what the people were saying. And the newspapers have no shame, they publish stuff that doesn’t have anything to do with anything. The journalists are worried because in Chenalhó some partidistas [political party-affiliated people] kidnapped some other partidistas. But the teachers do politics, they explain their struggle and the people hear them and understand them. We heard what the people say. They don’t listen to or understand the governments. They call Velasco “the kid” and complain about how “the kid” is only good for getting his picture taken and going out for a stroll. And the rumors say that he’s not even in charge anymore, that there is fighting to see who will take the governorship. They say that “whoever gets it is a shameless thief.” They don’t respect the government. They respect and love the teachers, they give them water and fruit, they applaud them. Even the cars, when they drive by the march, honk and wave. But the police only get insults. We heard one teacher explain their struggle: “This is now about putting food on the table for our children.” In one place close to Tuxtla, called Chiapa de Corzo, the people organized themselves and ran the federal police out of there. They weren’t teachers, they were families. The police hit them and threw gas at them, but the people didn’t give up and they ran off the federal police. Once we had seen all of this, we came back to give our report. What we think is that who knows what will happen, but the governments already lost. If a government isn’t willing to dialogue and negotiate with the opposition, what path does it leave the opposition? If the government only employs argument via the use of force, what does it expect as a counter argument? The Hour of the Police 2. That vendor of deodorant for metrosexuals, the postmodern version of Gordolfo Gelatino, Aurelio Nuño Mayer, should stop his campaign for the presidency and recognize that the reform he purports to defend is neither a reform nor is it about education. It’s merely a shameless personnel switch. A boss badly dressed in institutional clothing uses a perfumed foreman to get rid of jobs. To be an idiot foreman that longs to be a good policeman, follow these instructions: write 100 times, “public education in Mexico is a business and that’s how it must be managed.” Ah, and don’t study history. Forget that the National Coordination of Education Workers was born in 1979, in Chiapas, Mexico. And it was born as a response to government brutality. The battles that the teachers and the families wage do not end with May. They are just the beginning of many months and struggles that will come, and not only for the teachers. In the geographies and calendars below, history doesn’t happen, it is made.